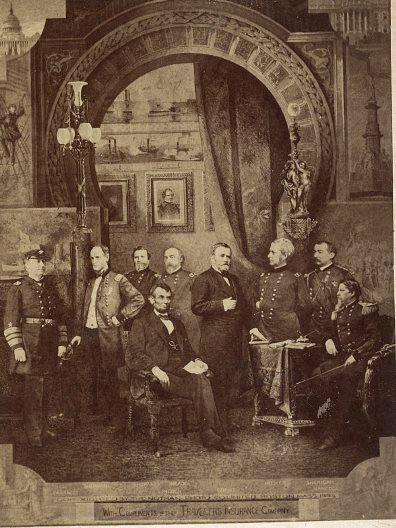 Photoshop has nothing on the photo montage specialists of the 1800s, who were adept at “trick photography.” Witness this historic Civil War era image title “Union Commanders” from the Library of Congress. Linton Weeks of NPR’s history department took a closer look, noting that although the photo is dated 1884, several of the people in the photo had been dead for decades by that point. It turns out it the “photo” is an example of an early insurance ad – from one of our insurance company partners, no less: A caption on the photo says “With compliments,” signed by Travelers Life and Accident Insurance Co. There was a similar image produced of Confederate generals. “The photo-artist “used individual photographs of the Confederate commanders and created a composite picture of them together,” she says. “The figures were cut from the print and pasted on a painted background. This process would be similar to using software like Photoshop in today’s terms to place images together in one photo. Photoshop may have made photo manipulations easier for the average person, but photo manipulations go way back. Check out this fun gallery of 15 Photo Manipulations Before the Digital Age. Whether using photos or illustrations, trade cards were a common form of advertising in the 1800s for all types of products and services. Life Insurance was a pretty common theme. Explores some fascinating examples of Victorian Trade Cards. Visit the insurer’s page to see a behind-the-scenes “making of” video and to see the insurer’s affiliated contest that invites users to compete for prizes by submitting their own VINE video clips.